Someone at Corgi must have been affected by the Summer of Love and persuaded colleagues to repaint a couple of cars and put psychedelic stickers all over them. 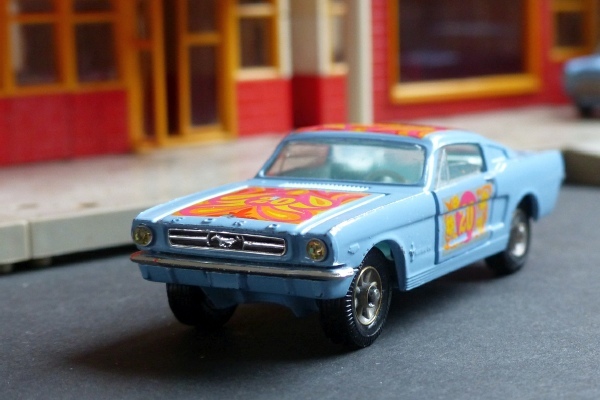 One was the famous ‘Pop Art’ Mini and the other is this Ford Mustang. My guess is that they had a lot of cast models left over. The Competition model hadn’t sold well so this was a candidate for the floral treatment. These are highly sought after and now valuable and this is a super example in really very nice condition. How often will you see chrome that is untouched and the paintwork is fresh and clean all round. There are only just the small nicks in the patterned transfers or this would be A+. This has been very well looked-after by a knowledgeable collector. It has no box but I am looking for one. You’ll find few others as nice.